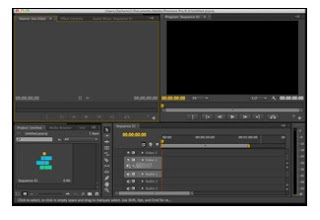 PC (Personal Computer) is used to process both the video file capture and editing using Adobe Premiere Pro software. PC to be used at least should have the following specifications: • Processor Intel ® Pentium ® III - 800 Mhz • 256 MB RAM • Hard drive speed 7200 rpm with a large capacity (empty space of at least 20 Gb) • Card 32 Mb VGA (monitor resolution 1024x768 pixels) • Sound Card that supports DirectX • CD-ROM/RW and DVD-ROM/RW to write in VCD and DVD format • Capture Card DV / IEEE 1394 Card • Operating System Windows XP Home / Pro Edition To use the Adobe Premiere Pro to use Microsoft Windows XP as the operating system. This is because Adobe Premiere Pro can run only on the operating system. Others with Adobe Premiere version 6.5 can still run on Windows 98SE operating systems and Windows2000.